Little Cody Bockman disappeared on a rainy morning. So begins the second installment in F. Paul Wilson's series about the teen years of his most famous creation, Repairman Jack. While it certainly isn't necessary to be familiar with the adult version of Jack to enjoy these books, I have to admit that that's their main appeal for me. Yes, there's secret societies and worldwide conspiracies and monsters and unsolved murders and hidden tunnels, but, for me, the real puzzle will probably always be Jack. Any glimpse, however brief, at What Makes Him Tick... well, that'll always be something I want to see. I should back up. To the future. Jack, as an adult, is known as Repairman Jack. He's got no last name and no social security number. To most people -- and the government -- he's untraceable. Unknowable. Unfindable. And for a fee, if he chooses to take the job, he'll solve your problem, whatever it is. Cool, right? Yeah. While I've never found Wilson's writing to be particularly stellar, Jack keeps me coming back. 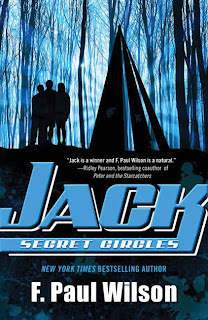 While Jack: Secret Circles suffers from the same lazy world-building as the first book did -- I was aware of the year (1983) purely because of the barrage of brand names and pop culture references mentioned -- I did feel that, aside from a plot point that hinged on the difference between VHS and Betamax in the second half of the book, the author got most of that out of the way early on. Which was nice, as it allowed me to settle in and enjoy the adventure, rather than thinking about Bauhaus. And what an adventure it is -- it's got all of the stuff I listed before, with some real Nail Biter Suspense Scenes and Hold Your Breath Action Sequences. Jack exhibits bravery, smarts and compassion, as well as his famous temper and his own brand of justice. The first book, I felt, was weakened by an after-school special-ish subplot -- in this book, there is another such subplot, but rather than coming off as preachy and condescending, it serves to give us a better understanding of Who Jack Is. Book Source: Review copy supplied by the publisher. I'm very interested in all of the Repairman Jack books. The concept is intriguing, but I can never bring myself to read one. I think I'm wary of less-than-spectacular writing. Maybe starting with one of these "Young Jack" books might be worthwhile. Possibly -- but I do think that if it weren't for my previous adventures with Adult Jack, I wouldn't find this series quite as compelling. The first one I read was The Haunted Air, which is the 5th or sixth in the series, but was (for me) a great introduction to the character.